Well, my streak is broken, but that's OK! I didn't feel very well last night so didn't take time to post. Not feeling wonderful tonight, but grabbed the laptop and parked in front of the TV! This is my most recent swap creation, for a 'new catalog' category. I only ordered 2 sets (so far!) from the catalog, so I didn't have a lot of choice. I struggled a bit with this, it's a bit "busy", but overall I do like how it came out. Card base is Summer Sun, background paper is Good Morning Sunshine. Bird is stamped in Pacific Point on Whisper White, layered on Pacific Point. 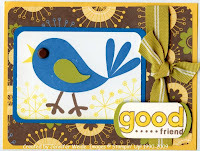 I rounded the corners on the bird layers and background paper to go with the 'good friends'. I stamped that in Basic Brown and colored in with Summer Sun ink using a blender pen. The key tag punch was used to punch out the 'good friends' and I punched a second one from Kiwi Kiss, split it, and layered it behind each side of the top layer. I tied a Kiwi Kiss ribbon around the background layer, and added the saying with dimensionals. The bird wing was cut from Kiwi Kiss by stamping a partial image and cutting it out. The eye of the bird is a brad from the new jumbo brad sets in the Chocolate Chip color. One more note. If you look at the bird in the catalog (Good Friend set), his legs are much longer. I masked the bird, and stamped the feet at the bottom of the white layer giving him the short legs. It's pretty quick and easy, and used much less paper then the full length leg! Thanks again for stopping by! Hopefully I'll feel up to stamping tomorrow!